A series of family turns has rendered me steward of an unusual collection of letters which a relative of ours preserved for decades. This epistolarium, this accidental archive, consists of correspondence exchanged among his various siblings, some brothers and a sister, during their adult years. Some bundles of letters span forty years of communication. Strikingly, the writer, at times, nestled carbon—and later photo—copies of his own responses next to their letters. He preserved these epistolary ties to his family in weathered brown boxes, six or seven total, which he labeled neatly with the initials of each writer and recipient. He filed many in chronological order. Also scattered among the slips of fragile paper, yellowed clippings, and handwritten notes were loose photographs cast in grey and milky hues representing a sea of faces gazing out into the space around them or at each other, fleeting life moments—perhaps not of the subjects’ choosing—concretized in film. When I first encountered these boxes, they seemed haunted by my relative’s embodied presence . . . his familiar handwriting, his penchant for order, his investment in quality products that would stand the test of time. Even now, although I never observed the act, I can imagine his tall frame leaning in to place those initials in black ink, carefully, intentionally, across the spines of each of those brown boxes that now inhabit space in my home. “Evocative Objects.” Photograph and caption by Lucy E. Bailey. Personal collection. Although these letters are currently in my “possession”—if one could consider such objects possess-able—I have circled around them with little sense of familiarity and ownership and great ambivalence because they seem haunted, as Cvetkovich writes of any archive, “by the specter of death.” Haunting, Gordon suggests, “alters the experience of being in time, the way we separate the past, the present and the future.” I only hold these letters because “he” no longer does, as they were hauled en masse from his shelves when the writing from his siblings stopped and the inevitable time came when he could no longer sort, hold, and savor them. And it was only years after all of the writing stopped that any of us knew the letters existed at all. I don’t think he hid them; but he would not have felt compelled to discuss them widely with others, as these were his own “evocative objects,” his own archive, saturated with his own affective epistemologies, his own webs of relation. Under my gaze, with my own historical, affective and archival preoccupations rooted in non-positivist research approaches in a different period and context, the meanings of these boxes shift. As I have pondered the haunting presence of these boxes and pages and photos that hover in the periphery of my vision, my mind has wandered through the theoretical terrain available for framing such objects and the potential paths I might follow to make sense of them. To pursue a particular analytic trajectory with historical materials is an act of power, a choice that frames and excludes, that “lights” certain things up while leaving others in shadow. And power operates because the researcher/descendant/archivist still lives, however temporarily, with access to such objects while “they” no longer do. The very stuff of history is built from centuries of historians and biographers and family members designating “what ‘counts’ as archival material worthy of study” and grappling with decisions about when to share, what to say and how to frame, and in the end, moving forward with their arsenals of available tools and partial materials to craft some kind of meaning. And inevitably, most will make choices about what to say and how to frame without access to the wishes of those who produced the objects, perhaps embracing such absences with relief, as a convenient form of consent for us to proceed at will with our analytic business, or, considering their wishes as simply less important overall than our lust for archival materials and our hopes and convictions as relatives/historians/biographers that such documents might prove valuable to ourselves or others. I do not know what “his” wishes were, and I do not know yet what value these documents might have for broader educational matters. Carolyn Steedman suggests that archival materials such as these are “nothing,” Naomi Norquay reminds us, until they are taken up as objects of inquiry, as sites that matter. Certainly, at the very least, the appearance of these objects offers me a role as an “accidental archivist” should I choose to fully embrace it, and materials for cultivating a “narrative inheritance,” should I choose to subject them to a type of analysis that might enhance our inter-generational script of family identity. As Goodall writes of his own quest to understand his father’s mysterious life as a spy in his work, A Need to Know, narrative inheritances are important ways of making sense of self and family. “What we inherit narratively from our forebears,” he writes, “provides us with a framework for understanding our identity through theirs.” Goodall approaches the content of letters and other documents as vehicles to access and craft this inheritance, however partial. He felt he “needed” to do so. 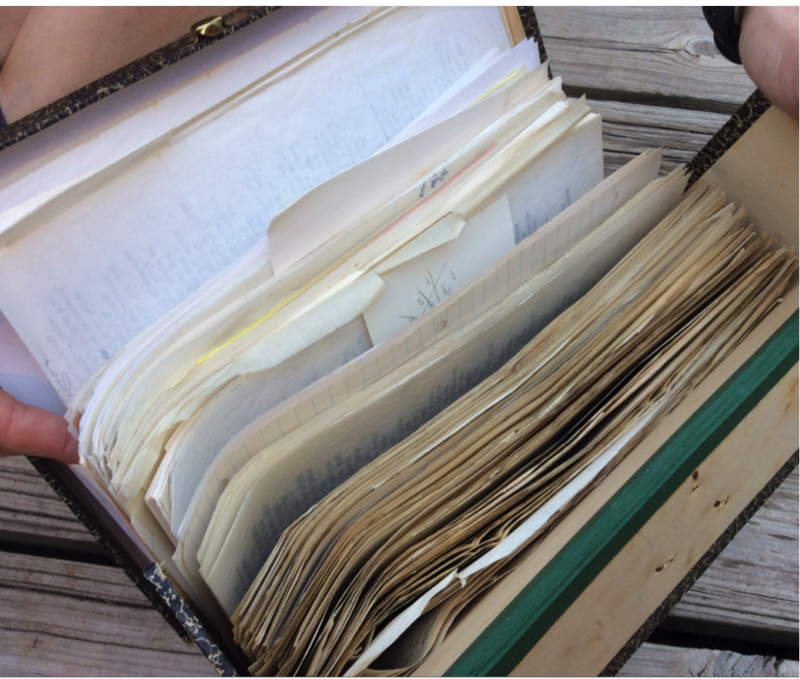 This theoretical approach is perhaps the most organic and realist choice I might make—to imagine these boxes as salient objects of a genealogical gaze and potential contributors to a family legacy. I didn’t “know” these relatives, these ancestors, and I could choose to analyze their letters as “windows” into their lives. Yet this is only one choice one might make with this epistolarium; and the limits of such realist framings are apparent. The recent theoretical turns to affect and materiality that compel new ways of conceptualizing material aspects of the world and of undertaking historical work reminds us that we relentlessly construct such documents and objects in humanist terms: how humans used them, what they reveal about humans, what relationships among humans they fostered. The very hauntings and imaginings with which I introduced this essay are examples of such constructions, and offer particularly powerful framings because such “family” epistles are saturated with the potent cultural and nostalgic weight of bloodlines. They are the stuff from which family histories are constituted. I have written previously about the discursive power of “bloodlines” that shapes inquiries that happen to involve “family” members. As I have suggested elsewhere, “family” and “family histories” are constructed entities borne of discourses of belonging, the politics of representation, and differential racialized, classed, and gendered access to a narrative inheritance; our ability to create them depends on patterns of orality and literacy, privilege and erasure, and the eccentricities and politics of documentary survival: attic trunks and turns in stairwells. The extent to which “family” is a salient concept in such endeavors depends on varied factors including researcher-subject relations, theoretical investments, and project purpose—whether, for example, the particular project is on, with, or simply through the materials family members’ leave behind. My relative’s letters raise similar methodological complexities. Yet inquiries “with” such documents do not necessitate analysis focused on “family,” or using family methodologies, and affective investments in historical objects, of course, need not depend on constructed “family” connections at all. Scholars have long-noted the ease of “falling in love with their subjects” through the material remnants of their lives and the range of analytic lenses available in making meaning. In the case of letters, scholars have considered their instrumental functions that “we” use or that “they” used in the past to inform, to communicate, to connect. Such objects can connote meaning beyond their denotations, signaling care, commitment, affection, and relational investments through sustaining key linkages with others. Such objects might function as evocative companions accompanying us on our life journeys that serve as touchstones for and storehouses of meaningful life events. They might have functioned this way for my relative, as they have for many others. Or, we might consider letters as intimate objects we feel at “one” with—such as we might with wedding rings, our father’s watch, our pacemakers, our photographs—entities we experience as extensions or fibers of our own bodies. And, via Foucault we might also consider how the power relations and discourses in which “letters” and “family letters” are situated and which remain from others’ labor and care produce and discipline subjects—in this case—potentially he as a sibling in a web of emotional relations and me as a descendant and accidental and potential archivist. Academic and family discourses shape in powerful ways how we might understand and theorize personal letters and relationships as legitimate objects of knowledge. And, still further, we can consider such objects as commodities which we barter and exchange in particular emotional, political, market and/or academic economies. These rich options for theorizing objects do not exhaust their conceptual potential. Given the common humanist framings that shape our relation to objects, theorists of the new materialisms underscore our struggles to conceptualize or allow objects to have biographies and histories of their own that transcend their supplemental, symbolic, and utilitarian meaning granted through human use. Our anthropocentric orientation conceptualizes the various material objects that we encounter, utilize, embrace, and carry with us on a daily basis in terms of their meaning and function and service for our own lives rather than as having a coherent subjectivity and ontological thingness that exists beyond, alongside, or outside of human use. How might we think differently about objects? How might we consider a world of objects, of matter, without us? Or as matter that, in fact, makes us? And what does such framing mean for theorizing those haunted brown boxes inhabiting, however temporarily, the same space in which I reside? If I was to write a biography of these objects—not based on their content, their constructed role as epistolary remnants of a life, or as part of a discourse of family “belonging” I might imagine and pursue, but their materiality, the essence and history of their thingness—I would have to begin from a different set of questions and imaginaries. I would have to consider the “origin” of the objects themselves: how they came to be, perhaps, through the growing of seeds, the felling of trees, the processing of lumber, the creation of pulp, the passing through machines, through factories, through nameless men’s hands to become “paper;” then bound, carried, sold or exchanged in local economies, and eventually coming to inhabit space with a man who selected, stored, used, exchanged, and transported them across states and years, where they were imprinted, read, re-read, re-filed, re-shelved, moving through, with, and out of the hands of people who I will never know—and bearing still today the physical traces of their very skin cells. In this journey, the objects shifted and changed as people touched them, handled them, read them, and inscribed elements of their bodies into the ink as they bent over and pressed their pens into the pages. The pages changed form and color, becoming tattered, yellow, and worn. At the same time, the objects chafed and dyed the flesh of the hands that held them, merging the matter of flesh and of fibers together as they moved in and out of spaces and receptacles in their mutual becoming. In this view, “objects have life roles that are multiple, fluid” beyond their human use. The “worn,” “tattered” objects I call “letters” or an “archive” are still evolving through, with, and beyond me, and my own constructed investments are only partially relevant to their becomings. In such a biography of objects I would have to consider that as these entities rest in the dust and pollen and heat of their environs and move through my hands and mingle with my own skin cells they—and I—change further, shifting, transforming, deteriorating, leaving traces of my ancestors’ bodies on my own before they move through and out on their papyrological journeys to other encounters. I simply serve as an instrumental and temporary steward; one small force in their becoming, and their materiality one small force in my own. If these trees-then paper-then letters-now archives have their own biographies, then they are not and cannot be “mine” despite the weighty presence they have in my pondering; contributing to forming me in passing, and perpetually transforming and becoming. This trajectory of thought foregrounds the politics of obligation at work in preserving and sharing and serving as a steward of material objects. In Mauss’s early research on gift exchanges, he insisted that a gift that enters one’s life (in this case a happenstance gift of letters), “imposes obligation in the present . . . the thing received is not inactive. Even when it has been abandoned by the giver, it still possesses something of him . . . there is a succession of rights and duties to consume and reciprocate, corresponding to rights and duties to . . . accept.” In this perspective, gifts are always tied to social relations, to the individuals who give and receive the gift. Indeed, my relative’s intent may haunt the gift. And Norquay reminds me that my “archivist status is bequeathed, an inheritance, one might say, not something that [I] chose.” The politics of obligation may require that these letters remain on a shelf, under theorized, their content read solely by family members, if his archival intent was to prioritize their constitutive nurturing of webs of family relation over their other semiotic and historical potential. The methodological and interpretive complexities I narrate here shape all such work “with” and “on” “family” documents, both complicated and perhaps nourished by the conflicting roles a researcher/family member/archivist simultaneously inhabits in the endeavor. In this case, I do not yet know the choice I will make—the picture has not yet come fully into view. Naomi Norquay of York University and Thalia Mulvihill of Ball State University served as peer reviewers for this essay. Education’s Histories is grateful for their careful attention to and thoughtful feedback on this essay. Navajo Girls in Footrace, Navajo Reservation, Arizona, July 4, 1913. Photograph by Joseph Dixon. Courtesy of the Mathers Museum of World Cultures, Wanamaker Collection, Indiana University, Bloomington, I.N., W-5386. Navajo Boys at Start of Footrace, Navajo Reservation, Arizona, July 4, 1913. Photograph by Joseph Dixon. Courtesy of the Mathers Museum of World Cultures, Wanamaker Collection, Indiana University, Bloomington, I.N., W-4760. “How did you come through the experience of being schooled?” asked the education historian. “I was born to words, truly, ma’am—very old words, from the time when dogs could talk,” responded John Pai. “I . . . remember myself,” Pai said. “But, then, how did you come out to consider yourself an educated person?” asked the education historian. “I was a camp child, a child of the cloth, trade cloth. I preached to the dogs in the name of the Sailor, the dragonfly, and the muchacho. Amen,” he said. “Hmmm,” (Pai chuckled in the historian’s mind). “Did you trick the trickster?” she asked, winking. The trickster is not a singularity. It acts and is acted upon. As it tricks and is tricked, as it opens up pores for alternate possibilities, it engages individuals and communities in sometimes mundane and sometimes transformative ways. Scholar Gerald Vizenor writes that “[t]he trickster is a communal sign, never isolation; a concordance of narrative voices. The trickster is not tragic because the narrative does not promise a ‘happy ending.’” The school invites such a “concordance of voices” even if it doesn’t mean to, begging the chance for trickstering and other potentialities. Most conventionally, and as most non-Native reformers had idealized, the school was a means into the mainstream U.S. economy for American Indian students, offering manual training in recognized vocations. The formalized, written curriculum itself and student accounts of their experiences at schools run by the U.S. government attest to that. Designed for industrial schools modeled after the Hampton and Tuskegee Institutes, Estelle Reel’s 1901 Course of Study for the Indian Schools of the United States, Industrial and Literary delineated a manual training and domestic arts curriculum that included blacksmithing, carpentry, engineering, agriculture, printing, cooking, housekeeping, laundry, and sewing. The Course of Study also included study in traditional academic subjects like history, music, math, reading, geography, and physiology. For Max Hanley, the Sherman Institute in California credentialed his skill in the several trades he had learned there. The credentials verified his vocational competency to the world outside the Indian school; they were a pore for Hanley. The credentials and the training that buttressed them were evidence that Hanley participated in a schooling experience that was familiar—at least on its face—to Americans with many different backgrounds. In this way, the school’s recognition of Hanley’s skills affirmed his potential as a viable “American.” But his credentials do not necessarily convey whether or not Hanley had converted himself in a wholesale fashion. Hanley appears to have stepped through the instrumental portal by specializing in several trades, yet he identifies himself as outside the Euroamerican pale. The ideals promoted by the school to refashion Indians into Americans fell in upon themselves. Hanley was a skilled Indian straddling cultures. As such, Hanley tricked the school as he confounded the reformer-idealists. Hyde writes, “trickster stories are radically anti-idealist; they are made in and for a world of imperfections.” Instead of a “happy ending,” there is an ambivalent and ambiguous one. The ambiguity that trickster invites—in spite of itself—allows for a dynamism that can refashion and reformulate culture. As the school bit Native students, it also provided an unwitting forum where a pan-Indian identity and literature developed. For example, literary scholar Amelia V. Katanski writes that school newspapers were the subversive proving grounds for several American Indian writers. Though school superintendents attempted to control the content and form of articles published in the papers, students found fissures in the domineering authority of the school, and shimmied through them. N. Scott Momaday’s John Pai finds his way through the school’s personnel and curriculum, winning a spot at seminary. When three of his friends freeze to death when attempting to escape the school and return to their families’ camps in a winter blizzard, John Pai discreetly disembarks from his journey to seminary to return to his family’s camp. The faculty laments his “running away,” believing that he decided to forget his Euroamerican schooling. Katanski argues that John Pai had cultivated and acted with a “repertoire of identity” that the school and its faculty did not recognize. In writing John Pai, Momaday refashioned and reordered the categories through which John Pai might be understood. He was a careful study with a deeply rooted compass that could recognize learning portals and avert being sucked into the school’s vortex. The Hopi did this on a grand scale, reformulating the categories of meaning derived from the school encounter all together. Historian Matthew Sakiestewa Gilbert argues that the group of Hopi students, young and old, who went to the Sherman Institute in Riverside, California from 1907-1910 enacted another form of migration that was congruent with earlier migrations which had helped define Hopi experience and culture over many centuries. Whether or not the school recognized this is immaterial. Lewis Hyde writes, “In creating cultural categories we give shape to this world, and whoever manages to change the categories thus changes the shape.” The Hopi “jumped into the liminality” and bounced the colonialist purposes underlying the very existence of the school off of the school itself, creating a reformulation of cultural categories. Hopi Boy Racing Horse, Hopi Reservation, Arizona, July 8, 1908. Photograph by Joseph Dixon. Courtesy of the Mathers Museum of World Cultures, Wanamaker Collection, Indiana University, Bloomington, I.N., W-5687. Our trickster, the school, is a methodological and axiomatic guidepost. Historian Philip J. Deloria writes that the trickster “exceeds history, serving as a metaphor, a mode of inquiry, perhaps even a methodological position. Laced through that method is a lack of certainty, the possibility that any claim may invert itself and become its opposite. If one believes this, humility . . . stands as a critical ground.” The school, our trickster, shows us how we should and should not live in this world as it builds itself up and implodes in on itself. As it describes idealized forms of learning, it clouds unexpected learnings. It is prismatically muddled and a transparent wayfinder; it is the spotlight and smoke. Donald Warren of Indiana University and Christopher J. Frey of Bowling Green State University served as peer reviewers for this essay. We are grateful for their careful attention to and thoughtful feedback on this meditation. The following excerpt is Part 2 of a four-part essay “Our Trickster, The School,” published throughout May 2014. If this is your first time visiting our site, we encourage you to begin with Part I and Part II and continue on to Part IV. Subscribers to our site will also receive a complete version of “Our Trickster, The School” when the entire serial has been published. “Stop! Stop! If I laugh any harder, I’m going to cry,” exclaimed the education historian to her source. “He caught one by the tail and I clambered on its back and rode it about the pen. It was great fun. I felt better when I got off, and thought to myself that if my homesickness returned I would ride a pig again,” remarked Don Talayesva, a student at the Keams Canyon school in Arizona. “What else could we do?” Talayesva responded (in the education historian’s mind). The school might well stimulate learning, but that learning does not always follow the content and form of the formalized curriculum. For example, the school taught Talayesva that he was out of his home community and that in order to make it through his time at school and return home, he needed to remedy his homesickness. His method was perhaps unconventional, but that is what the school provoked. The comedic tonic of Talayesva’s episode is characteristic of the trickster. Anthropologist Paul Radin writes of the Winnebago trickster, “[l]aughter, humour [sic] and irony permeate everything Trickster does.” These qualities are necessary as trickster is the fool and the wayfinder. To be both the fool and the wayfinder, trickster has a plasticity that confounds and illuminates, sometimes simultaneously. Hyde argues, “[h]aving no way, trickster can have many ways.” Trickster is a sort of blank slate and mirror. Radin adds to this notion, writing that Trickster “wills nothing consciously. At all times he is constrained to behave as he does from impulses over which he has no control. He knows neither good nor evil yet he is responsible for both. He possesses no values, moral or social, is at the mercy of his passions and appetites, yet through his actions all values come into being.” Having “no way” and “no control” suggests that trickster is a conduit of sorts. Trickster responds to externally set conditions and sanctions. And because it does not know self-restraint, trickster is frequently overcome by its impulse to exaggerate and overreach. It is at this moment when trickster reveals its “creative fabulation, feigning, and fibbing”; it is also at this moment that trickster reveals the absurdity of the situation. Araphaho or Shoshone Boy, Wind River, Wind River Reservation, Wyoming, October 11, 1913. Photograph by Joseph Dixon. Courtesy of the Mathers Museum of World Cultures, Wanamaker Collection, Indiana University, Bloomington, I.N., W-5516. The naming of Thin’-je-zhin-ga (William T. Sherman) illustrates such “feigning,” “fibbing,” and absurdity. As the school’s teacher and agent, Gray-beard demonstrates how the school as trickster was the fool and thief. As Thin’-je-zhin-ga slid from his chair to the floor upon his introduction to the class and Gray-beard, playful disorder ensued, prompting Gray-beard to yell in order to effect silence. Upon attempting to pronounce Thin’-je-zhin-ga’s name, Gray-beard stumbles and becomes the object of students’ laughter. And, after Thin’-je-zhin-ga shot a spitwad that accidentally hit Gray-beard’s face, students again quietly, but gleefully, giggled. Gray-beard, as the school’s agent, was the fool. But he was also the thief. Gray-beard took Thin’-je-zhin-ga’s pop-gun, and he took Thin’-je-zhin-ga’s name, insisting that students assign another name to their peer. They chose William T. Sherman, the name of the Union general whose “scorched earth” policy against the Confederacy during the U.S. Civil War made him famous and whom, ironically, was named after the famed Shawnee leader, Tecumseh. Had the thief again become the fool? Flathead Schoolchildren at Flag Raising Ceremony, September 19, 1913. Photograph by Joseph Dixon. Courtesy of the Mathers Museum of World Cultures, Wanamaker Collection, Indiana University, Bloomington, I.N., W-4421. Having no compass, the school, our trickster, and its agents react to external forces and conditions in ways that overstep and make little sense. The school drew children in to its “uncanny territory,” and required its charges to act as colonialist operatives by renaming Thin’-je-zhin-ga. But the attempt at hegemony disintegrated as students gave Thin’-je-zhin-ga a Euroamerican name and an Indian name. Trickster’s trick boomeranged. Scholar Philip J. Deloria writes of the Lakota trickster, Iktomi, “At the moment he is tricking you, his trick backfires or reverses and become a trick on himself. Everything happens simultaneously.” The school was duped as it attempted to dupe others. In creating or acting in seemingly ludicrous situations, the school, in effect, creates or enacts contradictions; it lies. Lies can damage, and they can also serve as portals through which we can glimpse other potentialities. Hyde writes, “the problem is to make a ‘lie’ that cancels the opposition and so holds the possibility of new worlds.” It is at this juncture—the lie or contradiction that illuminates the trickster’s simultaneously appearing pinnacle and nadir—that the so-called pore opens. It is at this moment when the lie and the trickster become unhinged and when the novel learning can commence. The trickster shifts its shape and flashes alternate chances and choices. They are fleeting, ethereal, and real. What to do? If we miss the pore, the damage would seem to loom. But if we recognize that a pore has opened, do we look through the aperture and pounce on another potentiality? Can we counter the damage? The following excerpt is Part 2 of a four-part essay, “Our Trickster, The School,” published throughout May 2014. If this is your first time visiting our site, we encourage you to begin with Part I and continue to Part III and Part IV. Subscribers to our site will also receive a complete version of “Our Trickster, The School” when the entire serial has been published. I write this letter with much sorrow to tell you that I have spoken one Indian word. I will tell you how it happened: yesterday evening in the dining-hall Alice Wynn talked to me in Sioux, and before I new what I was saying I found that I had spoken one word, and I felt so sorry that I could not eat my supper, and I could not forget that Indian word, and while I was sitting at the table the tears rolled down my cheeks. I tried very hard to speak only English. Thomas Indian School Children Listening to Dr. Dixon, November 28, 1913. Photograph by Joseph Dixon. Courtesy of the Mathers Museum of World Cultures, Wanamaker Collection, Indiana University, Bloomington, I.N., W-4311. Thomas Indian School Children at Flag Raising Ceremony, November 28, 1913. Photograph by Joseph Dixon. Courtesy of the Mathers Museum of World Cultures, Wanamaker Collection, Indiana University, Bloomington, I.N., W-4312. “Hey! What did you do that for?” the education historian hollered as the sources tattled on the school. “I cannot lie,” the source remarked (in the education historian’s mind). “I don’t know what to say. I want to cry,” said the education historian in response. In the amplified U.S. appetite for land and natural resources after the Civil War, the school was to serve as the “civilizer” of children. It was also an unmistakable marker of colonization. For non-Natives, a school signified arrival; for American Indians, the school signified departure and even entrenchment. The Indian school and its curriculum, which followed a model of industrial training that was part academic and mostly vocational, ostensibly prepared Native students for life outside their home communities. American Indian students learned English, and with it, reading, writing, and ciphering; they also were supposed to learn individualism, materialism, love of country, Euroamerican gender roles, and functional trades. One such presumed manifestation of this learning is captured in Joseph Dixon’s images of flag raising ceremonies at different missionary and Bureau of Indian Affairs schools for Native children. As students were expected to develop a sense of individualism and love of country through their manual and academic studies, they were also to demonstrate these qualities during Arbor Day, Columbus Day, and U.S. Independence Day celebrations as well as through staged flag raising ceremonies. In both of Dixon’s flag raising pictures featured here, children are dressed up, wearing ties and woolen hats and sweaters, and they are lined up, with the smallest in front and the tallest in back. In the first image, Joseph Dixon stands in the foreground holding the U.S. flag as children of the Thomas Indian School in upstate New York look on, many with their hands in their pockets. In the second image, students’ facial expressions are clearly visible. They are not smiling, and they do not seem to be looking at the flag or its raising; rather, they appear to be looking at the camera, which was offset from the flag. Does this image demonstrate how the school had “civilized” Native children? Or might it demonstrate the motions that American Indian children went through in school because it was simply part of the educational procedure? John Dewey warns that we should not mistake the educational for the educative. He writes, “It may be fairly said . . . that any social arrangement that remains vitally social, or vitally shared, is educative to those who participate in it. Only when it becomes cast in an mold and runs in a routine way does it lose its educative power.” In other words, when the motions of learning are motions, the growth and the curiosity that beget self-sustaining learning are no longer in play. Was the school “vitally shared,” or was it “cast in a mold” and thus drained of its educative potential? Operating a washing machine, as Henry Roe Cloud did, demonstrates that the industrial school operated on a shoestring budget; it also demonstrates that schooling American Indian children may have been as much about control as teaching reading, writing, and ciphering. The school could be brittle. It could also induce students to cultivate a strong sense of shame and self-hatred, as Nellie Robertson expressed after she “had spoken one word” of Sioux at Carlisle, one of the most well known industrial Indian schools in the U.S. As the industrial curriculum modeled at Carlisle rolled out across the country in Indian schools run by the Bureau of Indian Affairs, it and its attendant school policies, such as hair cutting, military time, and renaming, ignored and shunned cultural categories of meaning and language that were resonant with Native students. Working as a vortex, the school sucked in American Indian children, attempting to recast them as Americans who would shun the historical and intergenerational influence of their families and communities. In so doing, the school and its muscle (Indian Office agents) pulled Native children into its “own uncanny territory” and “provoke[d] doubt.” Trickster changes us, and trickster just changes. It is a plastic shape shifter after all. As the school damaged children, it also created pores of absurdity and humor, thus opening up possibilities for new ways of making meaning. “How was school today?” the education historian asked herself. We might not like to think of the school as a figure or institution that dupes us; it is supposed to affirm our studied efforts and sensibilities. But the school, as an institution, does not always do this. Even as it offers an opening into another world with myriad possibilities, it often serves as a foil to the educative. And as it can squelch the educative, it can open a “pore” and offer a workaround out of a riddled situation. It is a trickster. As linguistic anthropologist Myrdene Anderson writes, “trickstering presents the truth such that no one can believe it—nor can they afford not to.” Might the school be a trickster? As a trickster, the school can serve as a methodological and axiomatic guidepost for historians of education. It can reveal explicit matters of curriculum, social endeavors, and educational intent. It can also cloak, concealing learning outside of school, broader matters of social formation, and cultural amnesia. The school as trickster likewise can manifest as a humorous tonic as it operates as “a pore-seeker,” as Lewis Hyde puts it, looking for gaps and ways through a seemingly impossible situation that were previously invisible. The trickster is the spotlight and smoke; it is the fool and role model; it is a prismatically muddled and transparent wayfinder; it shows us how we should and should not live in this world. 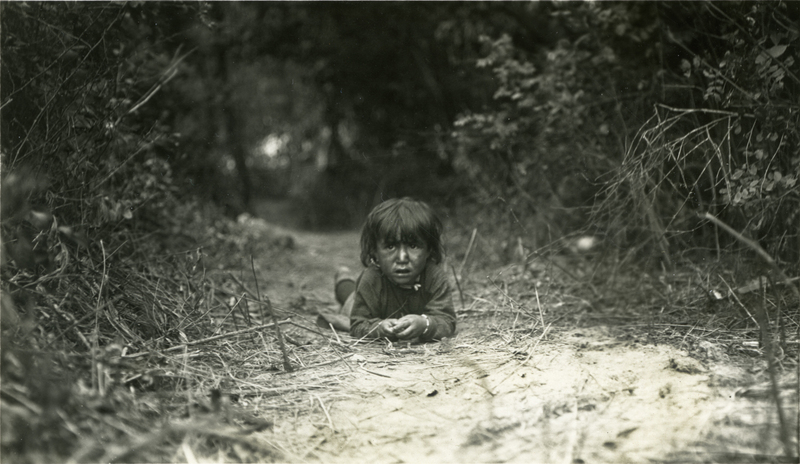 An Indian Boy in the Trail, Crow Reservation, Montana, 1909. Photograph by Joseph Dixon. Courtesy of the Mathers Museum of World Cultures, Wanamaker Collection, Indiana University, Bloomington, I.N., W-2394. U.S. Indian School, Carlisle, Penna., 1909. Photograph by Haines Photo Co. Courtesy of the Prints and Photographs Division, Library of Congress, Washington, D.C., LC-USZ62-25358. Lodge Grass Mission School Pupils Mounted, Lodge Grass, Crow Reservation, Montana, 1908. Photograph by Joseph Dixon. Courtesy of the Mathers Museum of World Cultures, Wanamaker Collection, Indiana University, Bloomington, I.N., W-0947. Education historians study the school because it is important. It is an aperture of sorts through which we can see the world and one that sharpens our vision of our society’s aspirations. For Horace Mann, the school had the potential to be the most beneficent and influential cultural creator the United States had ever seen. Nevermind that the nation, in 1848, did not quite cohere; the school had the potential to resolve the nation’s growing pains. So, too, could it remedy cultural conflict by streamlining and smoothing out the school curriculum through standardization. The school could inculcate moral instruction, rearing children by the norms and measures set by the state. “’It was ordained, just like the city on the hill,’” said the education historian. “Wasn’t it?” she questioned sardonically. The seriousness that Mann and his likeminded contemporaries devoted to the school matched the gargantuan task of creating a common culture and a national ethos. And this is how the school found itself a trickster: parents, and eventually the state, gave it their children and set particular conditions on the school. It was to teach reading, writing, ciphering, pan-Christian values, and the like; in doing so, it would be cultivating American citizens. These were the conditions, and this was the revealed purpose of school. Would it succeed? Would it fail? In the long game of social formation, the school was both a culture creator and an instrument of social control. For some, social control was an explicit purpose. Orville Taylor, an education writer and publisher of The Common School Assistant, wrote, “To govern men, there must be either Soldiers or Schoolmasters, Books or Bayonets, Camps and Campaigns, or Schools and Churches—the cartridge or the ballot box.” The choice was either school or social and political chaos. Historians Wayne Urban and Jennings Wagoner argue that the perceived threat of tumult was so dire in the increasingly urban, multi-ethnic, and mechanized Northeast that common school “crusades” were launched with the intention of pressing children into learning. In urban areas, which had significant concentrations of newly arrived immigrant populations, reformers were intent on recruiting larger numbers of children to school; in rural areas, reformers were concerned with improving facilities, teacher quality, and lengthening the school day as attendance was already high. In both the urban and rural contexts, the school served as a liaison for adaptation. Communities in both the city and countryside experienced rapidly changing possibilities for work and thus social life. Both types of communities needed reassurance that some recognizable form of life with interpretable categories for understanding the world would continue. This, in part, became the job of the school. Formalized learning, though, also carried with it the potential of arming groups that were supposed to remain disarmed. The school straddled its revealed purposes: before the Civil War it met the conditions placed upon it with free white children but withheld formalized learning from children who were slaves. By law, learning how to read and write were subversive activities for slaves. During the Civil War and immediately afterward, however, slaves and ex-slaves established schools for themselves and their children. Historian James D. Anderson writes that Blacks in the South “viewed literacy and formal education as a means to liberation and freedom.” Schools were so important, Anderson argues, that Black parents and communities did not trust outsiders to teach their children how to read, write, cipher, and learn the workings of the political and economic structures. Black communities established their own schools. For African Americans, historian Adah Ward Randolph writes, “The actual school itself was a manifestation of faith” in the revealed purposes and promise of formal education. The ubiquity of private Black schools in the South marked a threat to the social and political order of the planter and poor white classes. The school was simultaneously a savior and disrupter. With such focus on the visible roles of school in society, the broader role of learning as educative social and individual phenomena became submerged. In 1916, John Dewey wrote, “We have laid it down that the educative process is a continuous process of growth, having as its aim at every stage an added capacity of growth.” If Dewey is right, then the shine of the school has worked to conceal a multitude of other educational processes. American Indian education is an illuminating case in point. We know something about the formal schools that missionary societies and the U.S. government established to convert Native children to Euroamerican social, gender, economic, religious, and linguistic practices thanks to groundbreaking studies on boarding schools and children’s experiences in them. But we have not necessarily looked at the larger educative processes in play, such as how did Native communities learn to navigate the colonization efforts of the U.S. government and non-Native populace? How did Native communities create new categories of meaning to explain their places in the world? How did Native communities learn to navigate the economic and political systems imposed upon them? How have they learned to weather and even flourish in these systems? The school was a plastic shape shifter that served multiple purposes to contradictory effect. While it was the emblem of individual advancement and social uplift, it was also the tool that attempted to permanently strip cultures and languages from children. The school helped create a national ethos that was muddled in a colonialist enterprise.